Madame Alexander Fancy Nancy Collection - "Fancy Nancy" and "Bree" - Exclusively for the 2009 MADCC Fancy Nancy Event. The edition sizes weren't shown on the Certificates of Authenticity that year. 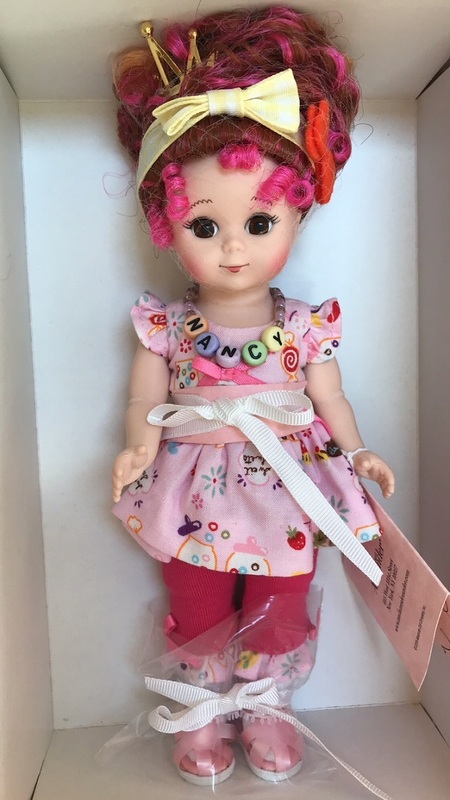 "Fancy Nancy" features a brown-eyed Maggie doll with a special face stencil. She has curly red hair with magenta streaks styled in an elaborate updo and adorned with a gold tiara and a bowed yellow headband trimmed with an orange felt bow. Nancy is wearing a pink print smock top with ruffled cap sleeves and pink bow trim worn off pink knit pants (lighter than in photo) with print ruffled cuffs and bow trim. She accessorized with white socks; pink jellies and a beaded friendship necklace with her name on it. 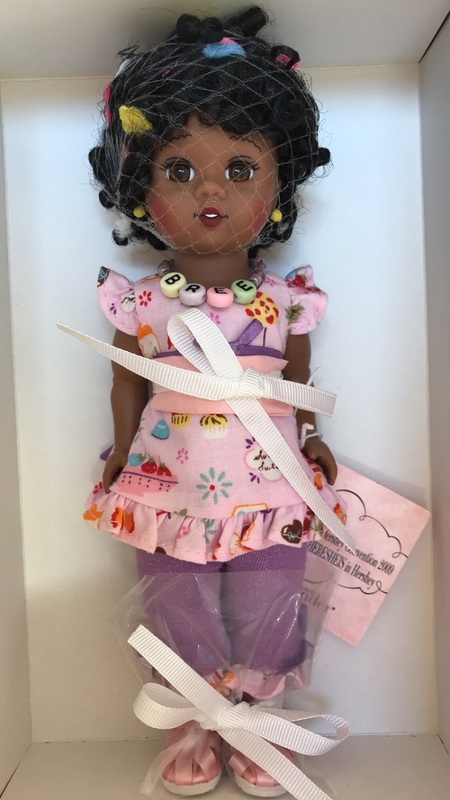 "Bree" - Fancy Nancy's best friend - has a dedicated face sculpt featuring a toothy, open mouthed smile. She has dark, curly hair wildly adorned with bright colored flowers and bows. She's ready for fun in a pink print top with ruffled sleeves and hem worn over purple knit pants with pink print ruffled cuffs. She's accessorized with white socks, pink jellies, yellow studs and a beaded friendship necklace with her name on it. 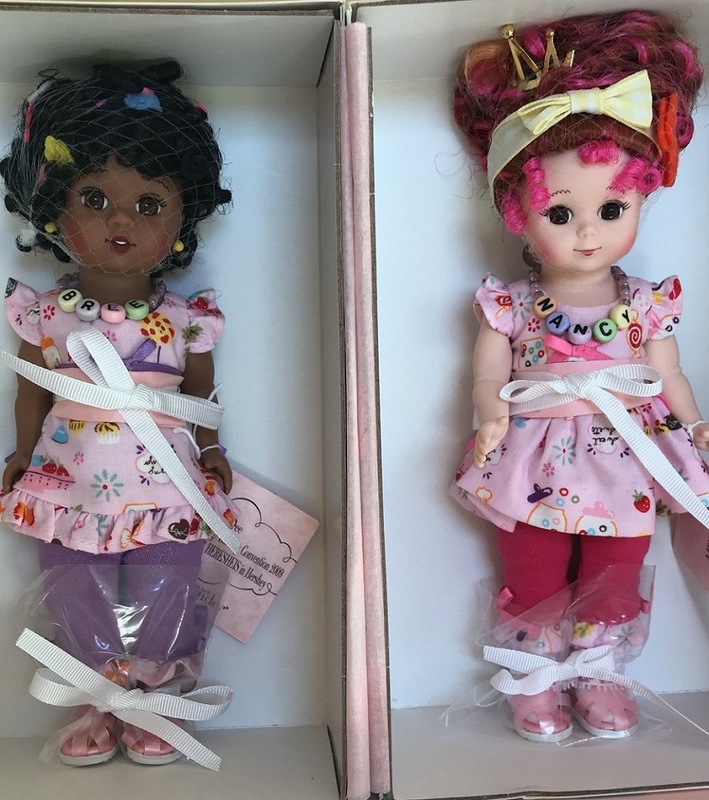 Neither doll has ever been removed from it's box and comes with little table favors of 'Fancy Nancy' boas, necklaces, etc. Both are bent-knee dolls and were photographed with their hair nets still on.